July 16, 2018 at 10:43 pm. WASHINGTON — A certain sense of deja vu will pervade the start of the 89th All-Star Game on Tuesday night at Nationals Park. 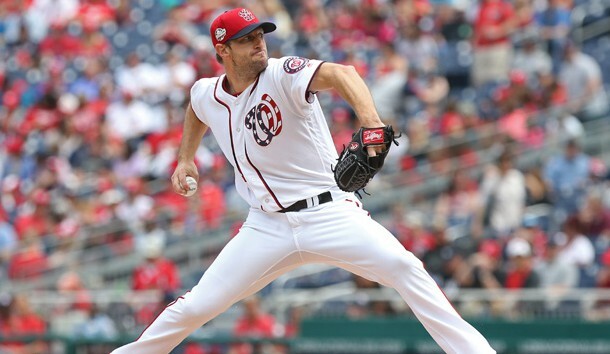 Washington right-hander Max Scherzer will oppose Boston left-hander Chris Sale in a repeat of last year’s Midsummer Classic matchup. It marks the first time since 1940 (Red Ruffing of the New York Yankees vs. Paul Derringer of the Cincinnati Reds) that starting pitchers have faced each other for two straight seasons. It’s the third straight start for Sale (10-4, 2.23 ERA), who joins Hall of Famers Lefty Gomez and Robin Roberts as the only pitchers to start three straight games. “He’s truly a special pitcher in this league and truly someone who deserves this honor,” American League manager A.J. Hinch said at Monday’s press conference. Scherzer (12-5, 2.41) got the nod over New York Mets pitcher Jacob deGrom, who boasts a league-best 1.68 ERA. Roberts said it was a close decision. The tiebreaker was the fact that the game is being played in Scherzer’s home park. Tuesday night marks the fifth All-Star Game in Washington and the first since 1969. After 88 All-Star Games, the series is knotted 43-43-2 and the scores add up to 361 runs for both teams. Last season, the American League defeated the National League 2-1 at Marlins Park in Miami, marking the NL’s fifth consecutive victory. The AL has won 12 of the last 15 and 17 of 21. Nine of the last 13 have been decided by two runs or less. Mookie Betts of the Red Sox will lead off for the AL and J.D. Martinez of the Cleveland Indians will bat cleanup. For the NL, Javier Baez of the Chicago Cubs bats first and Freddie Freeman of the Atlanta Braves cleans up. St. Louis catcher Yadier Molina is making his ninth appearance, and there are 17 first-time All-Stars on the NL roster and 15 on the AL squad. Baltimore’s Manny Machado, expected to be traded any day now, is making his fourth appearance. He was swarmed during Monday’s media availability. Scherzer is an All-Star for the sixth time. Sale is also a veteran of six previous games, making him a target of younger guys like Tampa Bay first-timer Blake Snell (12-5, 2.27) who want to pick his brain. The two had breakfast Monday morning. “I thought it was funny because when you look at the year he’s having, I don’t think he needs to talk to anybody or ask any questions,” Sale said of Snell. Though the game no longer matters in terms of home-field advantage for the World Series, Scherzer and others were obvious in their desire to win.